Taste test: These crunchy, thick-cut kettle-cooked chips had slight heat to them. 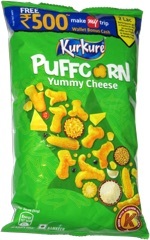 If you don't like a super-heated chip, these might still give you a kick without burning your throat too much. They were still pretty hot, and I didn't really taste any barbecue, since the heat dominated. 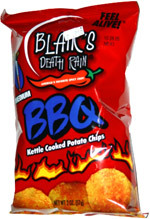 It would be nice if Blair's could make a chip without any heat, since the thickness of the chip and its crunch were pretty good. Smell test: Weird oily smell, not a good aroma.